The Force Awkakens | Get Off My Podcast! When we say we cover all movies Harrison Ford has been in, we meant it. Nothing proves that more than this episode. Can we make these two movies interesting enough to podcast about? Only one way to find out. One of these movies, Crossing Over and Extraordinary Measures, just might surprise you and could contain one of the more underrated performances of Harrison’s career. 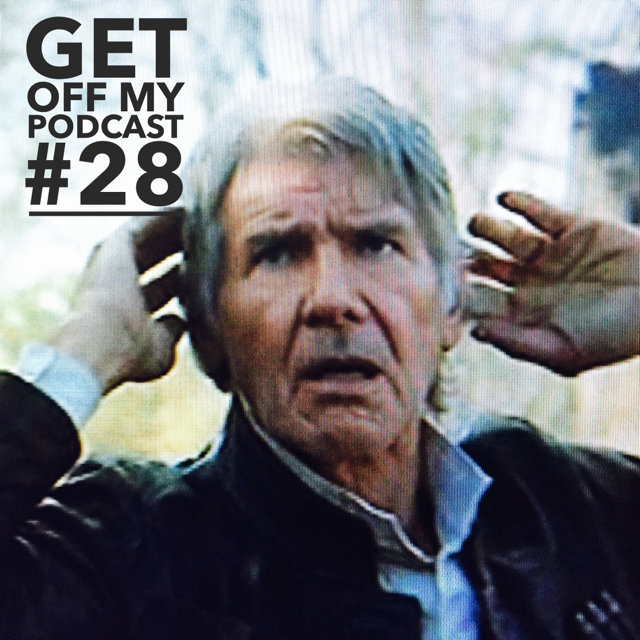 We also get into some current Harrison Ford news (there’s plenty of Force Awakens stuff going on) and learn about some fan fiction that could end up being Indiana Jones 5. Holy Wookiee balls we have new footage! The official trailer is out so we did a special episode to celebrate. We break down Harrison’s shots and go into what the hell is happening in the new Star Wars: The Force Awakens trailer! What’s the new edition to the Falcon? What kind of ‘feels’ does the Star Wars Trailer give us? How will WE be viewing The Force Awakens? Why does Leia looking so sad? How awesome is it that Harrison Ford…errrr, Han Solo does a major voiceover? Too many things to think about, dammit!